SAIC community members are once again an integral part of this year's EXPO CHICAGO, Chicago's international exposition of contemporary and modern art. Faculty and alums will be presenting work at the SAIC Booth, galleries, and participating in a variety of EXPO programming. The School continues its partnership with EXPO to facilitate /Dialogues, a series of panel discussions, conversations, and provocative artist discourse with leading artists, curators, designers, and arts professionals on the current issues that engage them. SAIC Graduate Curatorial Assistants Lindsey Bell (Dual MA 2019) and Neil O’Malley (MFA 2019) organized this year’s SAIC booth which will feature the work of recent alums as selected by the Graduate Fellowship committee. MFA 2018 graduates Kevin Demery, Irmak Karasu, Joo Young Lee, Justin Rosier, and Tsailing Tseng will showcase their work. Friday, September 28, 2:00 p.m. Featuring founding member of AfriCOBRA Gerald Williams (BFA 1951), and AfriCOBRA members Jae Jarrell (SAIC 1959–61) and Wadsworth Jarrell (DIP 1958). Friday, September 28, 4:00 p.m. Featuring Lynne Warren; SAIC Professor in the Film, Video, New Media, and Animation department Mary Patten; Kay Rosen; and Torkwase Dyson. Friday, September 28, 5:30 p.m. Featuring SAIC Art History, Theory, and Criticism Lecturer Lara Allison; SAIC Director of Public Programs and Senior Lecturer of Art History, Theory, and Criticism Amy Beste; Theaster Gates (HON 2014); and SAIC Associate Professor of Art History, Theory, and Criticism Michael Golec. Saturday, September 29, 2:00–3:00 p.m. Featuring Keller Easterling, architect, writer, and professor at Yale University; Laura Kurgan, associate professor of Architecture at the Graduate School of Architecture Planning at Columbia University; Robert Gerard Pietrusko, assistant professor of Landscape Architecture and Architecture at Harvard University; and moderated by co-curator of the US Pavilion Mimi Zeiger. Saturday, September 29, 4:00–5:00 p.m. Featuring Anna Griz, curator at KW Institute, Berlin; Andria Hickey, senior curator at MOCA Cleveland, Sean Raspet, artist represented by Jessica Silverman Gallery; Joey Tang, director of exhibitions at Beeler Gallery; and moderated by Director of Programming at EXPO Stephanie Cristello (BFA 2013). Sunday, September 30, 12:00–1:00 p.m. Featuring Dr. Daniel Berger, member of SAIC’s Board of Governors, co-editor of Militant Eroticism: The ART+Positive Archives, and founder of Iceberg Projects; Lola Flash, artist and Art+Positive member; and John Neff, SAIC Low-Residency MFA lecturer and co-editor of Militant Eroticism: The ART+Positive Archives. Sunday, September 30, 2:00–3:00 p.m. Featuring Dawoud Bey, artist; Leigh Raiford, associate professor in the Department of African American Studies at University of California, Berkeley; Steven Nelson, professor of African and African Art at University of California Los Angeles; and moderated by SAIC Painting and Drawing Professor Michelle Grabner. Friday, September 28, 1:00 p.m.
Join Donna J. Cox, Ellen Sandor (MFA 1975, HON 2014), and Janine Fron for a special signing of their new book, which captures the spirit and contributions of 22 women working with diverse, emergent media. Friday, September 28, 3:00 p.m. Soul of a Nation surveys the crucial period of radical change that was 1963–83, bringing to light previously neglected histories of 20th-century Black artists, including AfriCOBRA among others. Focusing on work created from 2007 to 2017, the publication is the artist’s first monograph. The book highlights SAIC Associate Professor of Painting and Drawing José Lerma’s breadth, inventiveness, and his constant interweaving of history, politics, and the personal. Dimensions of Citizenship documents contributions from the seven firms selected to represent the United States in the 2018 Venice Architecture Biennale. The book was edited by Nick Axel, Nikolaus Hirsch, SAIC Assistant Professor in the Department of Architecture, Interior Architecture, and Designed Objects Ann Lui, and Mimi Zeiger. Saturday, September 29, 1:00–6:00 p.m. This five-hour series of interviews led by Hans Ulrich Obrist will feature SAIC faculty and alums, including Professor in the Visual and Critical Studies department Joseph Grigely, Lecturer in the Contemporary Practices department Edra Soto (MFA 2000), Bill and Stephanie Sick Distinguished Visiting Professor Amanda Williams, Art Green (BFA 1965, HON 2016), Gerald Williams (BFA 1951), Suellen Rocca (BFA 1964, HON 2016), Richard Hunt (BA 1957, HON 1979), Stanley Tigerman (HON 2018), Jeanne Gang (HON 2013), and Theaster Gates (HON 2014). Judy Chicago’s (HON 2018) 1971 piece Women and Smoke will be screened in screening room two. Jenny Boyles (MFA 2018), Xiaolong Fang, Anthony Janas, Andy Slater (BFA 2015), and current students in SAIC’s Sound department Jack E Jacob (BFA 2019), Yitong Lu (MFA 2019), and Kevin McGrath (MFA 2019) / Yu Nong Lin (MFA 2019) will present their work alongside work commissioned by EXPO Sound curators Daata Editions. In/Situ features large-scale, suspended sculptures and site-specific works including Judy Chicago’s (HON 2018) Cartoon for The Fall from the Holocaust Project, 1987. 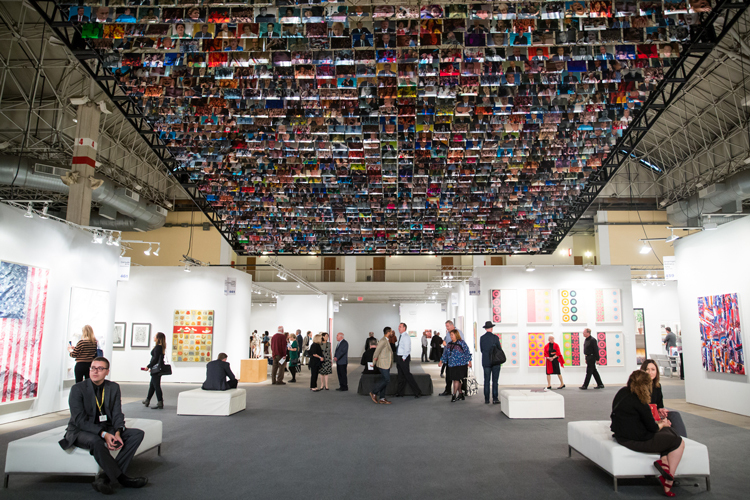 EXPO CHICAGO visitors are invited to the numerous art spaces around Chicago and experience the city’s vibrant art scene, among them alternative exhibition venues and performance spaces. Opening reception: Friday, September 27, 6:00–9:00 p.m.
Talking to Action investigates contemporary, community-based social art practices in the United States and throughout Latin America. This group exhibition attempts to build a direct dialogue with artists and researchers across the hemisphere to discuss shared concerns. Opening reception: Friday, September 28, 6:00–9:00 p.m. This exhibition presents work by Beatriz Santiago Muñoz (MFA 1997) who brings forth a new body of work, Safehouse, which presents film, video, and objects concerning the sensorial unconscious of the Puerto Rican anticolonial movement with Chicago as one of its headquarters. Fourteen artists will create work for the third edition of the citywide public art initiative OVERRIDE. Titled Interlude at Hand the program will feature works by Judy Chicago (HON 2018), Theaster Gates (HON 2014), John Bankston (MFA 1990), Brian Calvin (MFA 1994), Amanda Williams, and SAIC Associate Professor of Art Education Andres L. Hernandez (MA 2004) among others.